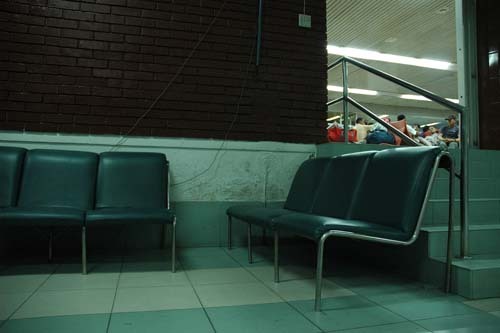 I stopped a fight between 15 men at 3am in Dhaka Airport, over one man wanting to sit in the seats pictured. These were the only comfortable seats left in the room where one could conceivably have a nap. The puffed-up official guy had some kind of strap stick thing I didn't want to see what he was going to do with it. When the fight broke out it was obviously stupid, so I picked up my stuff and walked very close to the combatants. They stopped fighting almost immediately. A number of other men in the airport trailed behind me in support of my gesture. 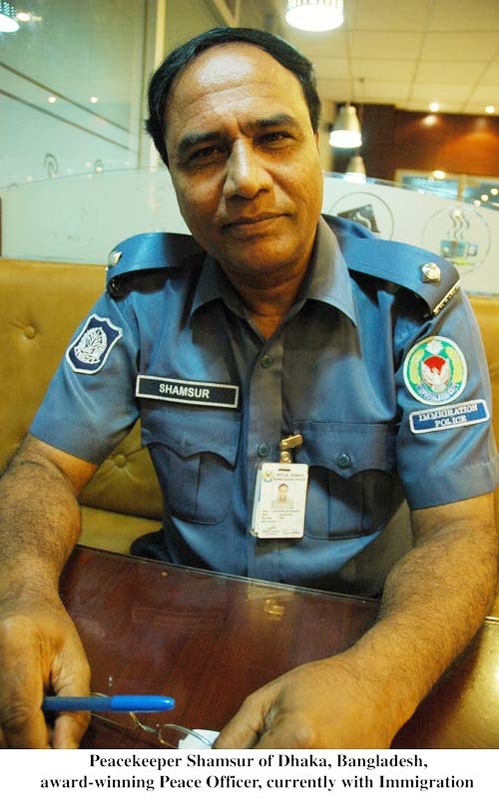 When I returned to Dhaka five weeks later, and forgot about the fight, I went to sit here and was told, "Madam, you may not sit here" even though nobody else was, and as you see above the rest of the airport was full of men going to be labor in other countries. It's kind of like slave labor. Globalization, who would ah thunk it. Since they have so little control over their lives they have to control others even when it is completely ridiculous. As you see there is no sign or any indication that sitting here could be a problem. So I threw my bags on the floor and laid down on the nice white marble floors for about 45-minutes right were I was. I was actually quite upset but trying to calm down. Men quickly ran in from the other rooms to watch me, I guess it was better than the TV blaring along in Hindi (not Bengali) in the other room - "Hey great first act - what does she do next?" I was not a happy camper. It was very difficult to get pure drinking water. 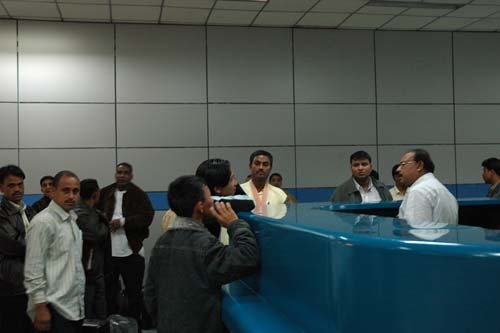 I went to a guard in a clear plastic booth and showed him my passport, and I read it to him in English the part where it is printed in the front asking representatives of foreign nations to render aid. I pointed out that I needed some aid in getting water, because I could not drink from the sink or fountain, and with no local currency I could not even pay to get water. 20-minutes later I had been escorted to the money changers - and bought some very expensive bottled water from the restaurant. The money changers saw how respectfully the soldiers were treating me and asked, "Are you a reporter?" I assured them that I definitely was a reporter - a Web reporter that is. Good luck going through Dhaka or Dacca or whatever, even the airport is dangerous. At least it is better than the last time when my plane landed here and we were held at machine gun point - many years ago. I have to say the school children in town treated me like a queen - they even presented me with a pink lotus flower - which is another story! I believe that it is not always possible to understand what is going on in a foreign country, but violence is never good.